The Orbital Express Truss™ System is one of the most commonly used truss display systems amongst exhibitors attending industry shows such as The Australasian Oil and Gas Exhibition & Conference (AOG), Queensland Mining Engineering and Australian Auto Aftermarket expo. Exhibitors like our truss display system for it's unique set of advantages: The only truss exhibit system in Australia requiring NO TOOLS for Installation - simply twist & lock. Our truss kits can be reconfigured in multiple ways using the same parts so you can have a different Truss display system design every show. We offer more than 60 professionally designed “off the shelf” kits for a variety of booth sizes and configurations. Custom designed configurations also available. 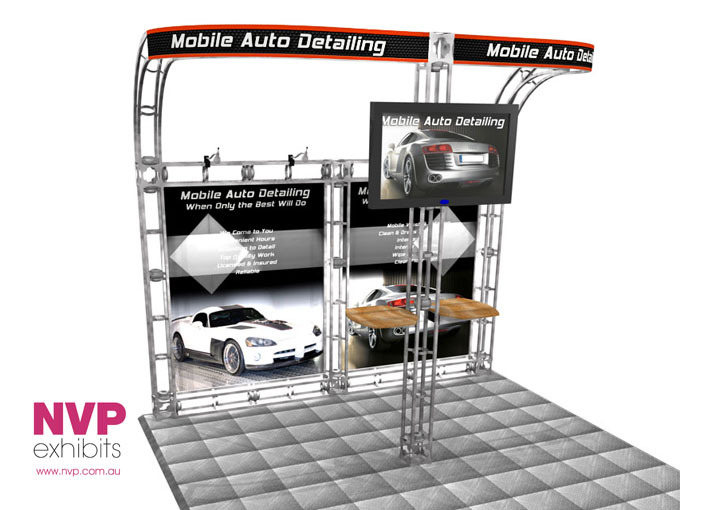 Our Trade show truss displays and exhibit systems available in Sydney, Melbourne and Brisbane.